This AWESOME picture was drawn on Marcello's AWESOME computer by Marcello's AWESOME girlfriend who was told to draw "someone eating a pumpkin" (she realizes how gloomy this AWESOME picture is after she submitted it). 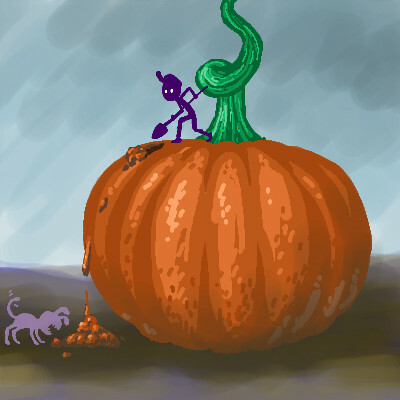 This AWESOME picture demonstrates how little people feed AWESOMEly big pumpkins to their AWESOME pets. Go pets! Had a wife and couldn't feed her? And then he pulled out a plum..
And Jill came tumbling after?